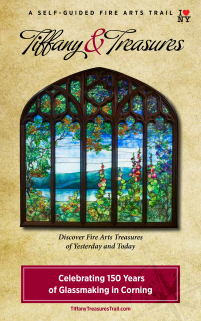 The Tiffany & Treasures Trail is a self-guided adventure in the fire arts treasures of yesterday and today, right here in Corning & the Southern Finger Lakes. Sites include working potters, glass artists, museums, and buildings completely designed by L.C. Tiffany. Shop, explore, create, and admire. Try the potter&apos;s wheel or make your very own glass souvenir at the Corning Museum of Glass. You can try to fit in the entire Tiffany & Treasures Trail in a single day, but you would get much more out of taking your time and spending a few days to explore and discover the amazing artwork that can be found in Corning & the Finger Lakes. Start your self-guided adventure in the fire arts treasures of yesterday and today!